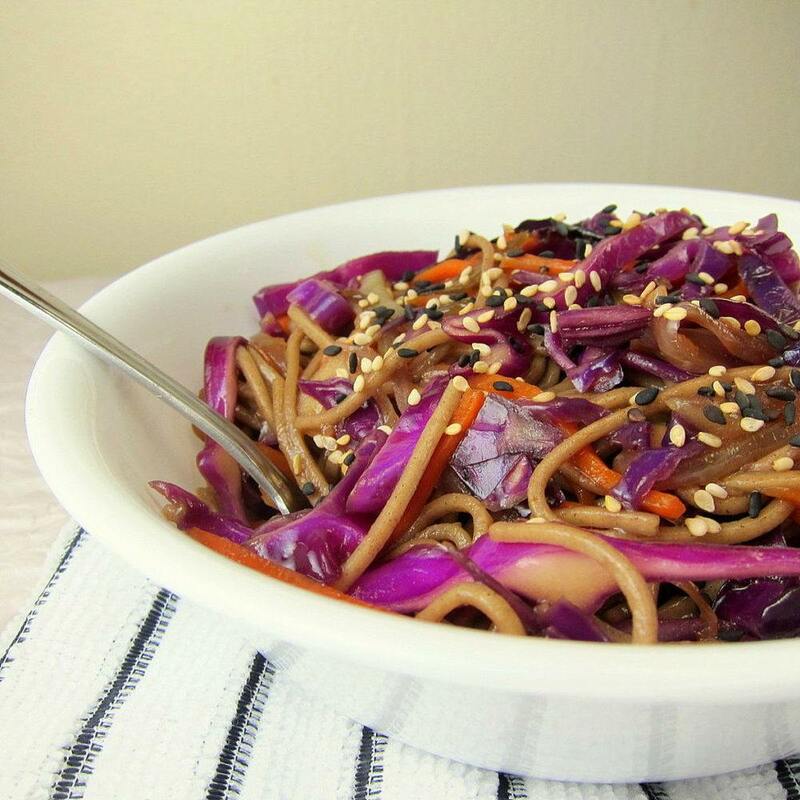 A 25 minute Soba Noodle and Red Cabbage Stir Fry recipe that is healthy, delicious, flavorful, and has a great crunch from the cabbage. Perfect for a weeknight. Cook soba noodles according to package (typically 3-5 minutes). Drain and rinse in cold water. Set aside. Prepare the sauce: Add all the sauce ingredients to a medium bowl and mix well. If your honey is very thick, microwave it for a few seconds to thin it out so it mixes better. In a large wok or a large skillet with high sides, heat up 2 tablespoons of sesame oil. Add the sliced onion, and stir fry for about 3 minutes over high heat, or until the onion starts to brown. Add the sliced cabbage, julienned carrot, and the remaining sesame oil and stir fry for about 3 minutes, or until desired done-ness of cabbage. I wanted to leave the cabbage and the carrots crunchy for a bit of texture, so 3 minutes over high heat was enough. Add about half of the stir fry sauce and stir fry for 1 minute, coating the cabbage mixture in sauce. Add the cooked soba noodles and the remainder of the sauce. Stir fry for about 2 minutes, or until the sauce fully coats the noodles, the cabbage and the noodles are well mixed, and the noodles are warmed through.Serve warm with a sprinkle of sesame seeds.